Tried to be fancy with my coffee today and made a clover leaf stencil - just humour me please. Over at Kimmie's place (and Pat and Patty's) its 'Tea on Tuesday', plus a bit of chat. Well .... did any of you watch the new series on TV last night about the Pre-Raphaelite Brotherhood? I'm a big fan of the PRB and it encouraged me to get out all my gorgeous books on the subject. Even DH became quite interested. I have a very old book about Rossetti which I bought about 30 years ago from a junk shop. I've never really flicked all the way through it before and was rather surprised when this fell out...a postcard dated 1904. Its a picture of Bournemouth (where the book was first purchased). 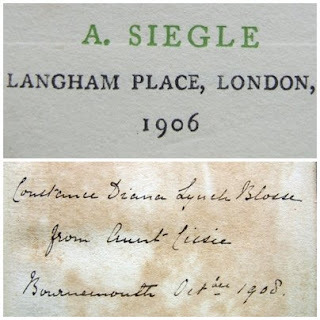 The book was published in 1906 and the inscription inside is 1908. Here's the man himself...a self-portrait from inside the book (it has tissue papers covering the pictures). 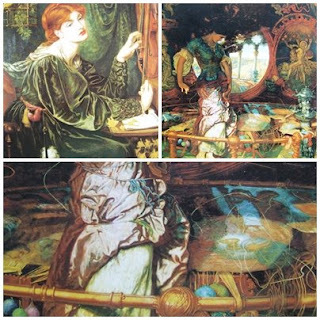 Here are my favourite paintings from this - which is my favourite PRB book. Just look at those fabric folds in the detail! They were certainly a talented bunch of artists.....if you want to find out more about them look here. Just wanted to thank Tara at www.aquamarineart.blogspot.com (a new friend I met through Suzi's class) for giving info on her blog about Photoscape which you can download for free here. Thats how I've put some of my pictures into groups!! LMBO@ the lady in blue reminds you of how you look in the morning, I look the same way. What a lovely find, and to think it was there all the time right under your nose lol! Thanks for sharing. Very posh coffee! What a lovely surprise to find the postcard in the book and it had been there all the time without you realising - hidden treasure. The paintings are so romantic - lovely images. There are a lot in Manchester too if you're ever up this way. well there were but they've gone all 'outreach' now so i don't know if they still have them on show. I think you are right about the fabrics. That era's painting illicits tons of tactile memories for me. Thanks for the mention - glad to be of assistance! I love that painting of the Lady of Shallot (sp?). Yes please, I'll have a cappucino with a four leafed clover...looks yummy! What a gorgeous little book and those colour plates!!! I think this artist has an obsession with fabric too. Loooove how he paints fabric and especially the quilt/embroidered piece in the woman in the boat...from reading the comments 'The Lady of Shallot'. Dear Linda thankyou for your lovely message, next time Im down in Bakewell Ill get in touch and perhaps we could meet up. Jim and I watched the programme by chance and both of us were hooked ~ your book looks amazing and what a fabulous self portrait, enjoy your trip to Birmingham and hope you gets lots of inspiration. sounds like a wonderful show....on one of my fav topics too...velvet and satin oh my!!! thank you for so many lovely links and lucky you with a treasure of a book like that...that postcard has been waiting for you to discover it! Oooh I want to know more about this new show! I love the PRB very much. I am a huge fan of Sir Lawrence Alma Tadema. The Getty Museum, just a few miles away houses my favorite painting of all time... Spring! It's so magical. 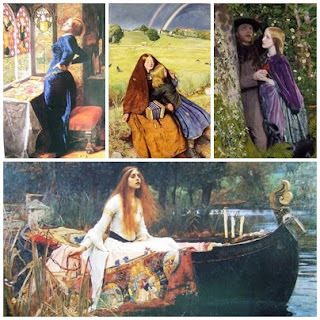 I love Waterhouse too and used a lot of those images when I first got into to collage and mixed media. So beautiful! Oh, I'm annoyed I missed that TV programme. 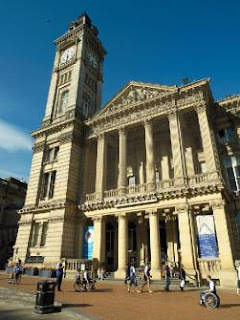 it's the new or revamped (not sure which) Birmingham Museum and Art Gallery online resource. It uses Microsoft's silverlight programme so you can see the paintings in incredible close up. I went to Birmingham to see them (PRB's), but the rooms were shut because of roof problems at the time!! Just as well I didn't have to travel far in the first place. Hope you have a great day there! wow, the coffee looks yummy, well done . Another huge PRB fan here too. what's not to love about the colours, themes and personal stories?